I admit...I'm not doing amazing at wedding planning. I have these elaborate ideas, but I just can't seem to get them all together. Even though I am a pretty organized person, and I thought that I would LOVE to plan a wedding, I am finding it a little bit overwhelming. There are so many details it is just crazy, and frankly, I don't really know what to think about some things. 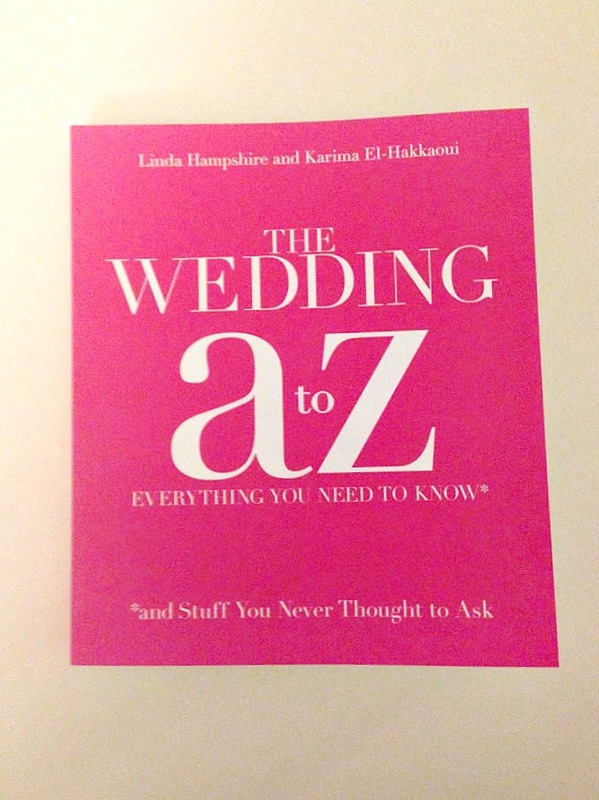 I received a copy of The Wedding A to Z from Blogging for Books. The subtitle of this book is "Everything You Need to Know, and Stuff You Never Thought to Ask." I thought that this would be a perfect way to help me get some of the details straight that I seem to be clueless about. This book is very thorough. It includes everything you could possibly want to know about the big topics to small details. From alcohol to manicures to zodiac. Chuppah- I knew that this was a Jewish tradition, but I did not know that it represents the home that the couple will build together. I love that idea, and I would love to incorporate that into our ceremony. Haggling- Strategies to help you haggle like a pro. You might not like to haggle because you think it makes you look cheap. But if you think of it as negotiation (after all, this is a business transaction), you will be more comfortable with it. This can help knock some serious $$$ off of the price of vendors! Names (to change or not)- This is a hot topic! This section outlines how you change your names, why you might want to and why you might not want to. I have my opinion, which I'll share with you later, but this is very informative. Toasts and Speeches- Who needs to give a speech, when they should give them, what to do if that person has a fear of public speaking. Sometimes I think people get so fixated on having everyone give a speech, and then there are a million speeches and toasts being given and it all gets out of hand. Longer and more does not equal better. I had my eye on that book but went for The Knot books instead. I seriously love Blogging for Books. I am not Jewish, but I have worked with Chuppahs many times and did not know the meaning behind it. What an incredibly sweet sentiment. They really look stunning in photos as well. I can't wait to see your wedding! I've loved blogging for books! There are some great finds on there! We aren't Jewish either, but I love how they look! I just love sentimental things like that. I can't wait to see yours either! I love WW and watching everyone's weddings come together! This sounds like a great book. One of my bridesmaids gave me a planning book when I first got engaged and it has been the best thing in aiding the planning process by far! It's super thorough as well. I am curious about some of the topics you mentioned above though, so I may have to check out this book. Any clue where I could find it? I got mine on Blogging for Books, so check there first, but you could probably try on Amazon!